Register Log In ECN Forum Forums Violation Photo Forum Now it’s your turn to identify the violation! How well do you know the Code? Think you can spot violations the original installer either ignored or couldn’t identify himself? Here’s your chance to moonlight as an electrical inspector and second-guess someone else’s work from the safety of your living room or office. 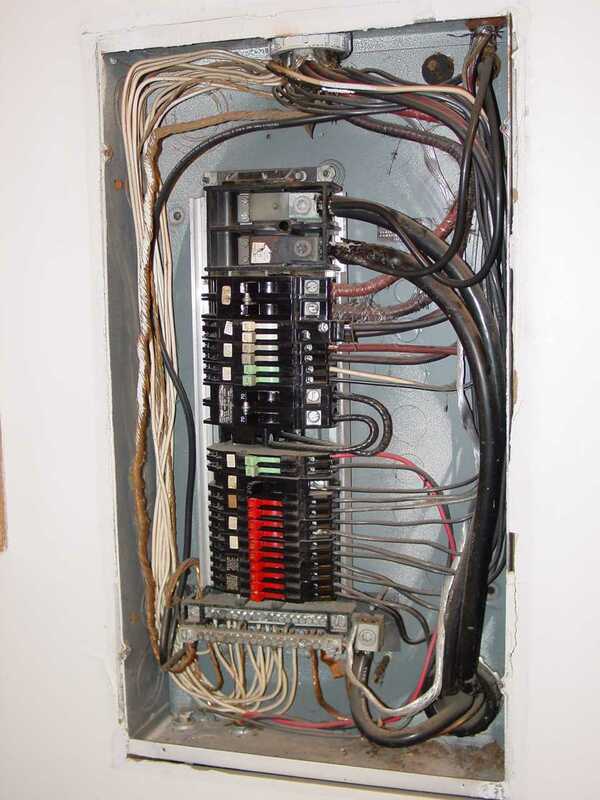 Joe Tedesco, who has a knack for finding shoddy electrical work, did the dirty work and found this mess. Now it’s your turn to identify the violation. Well the pipe should be reemed and then we need a fitting with some type of bushing.And with the looks of the conduit it might be a little tight for both of them. A one word "What's wrong" would be EVERYTHING! 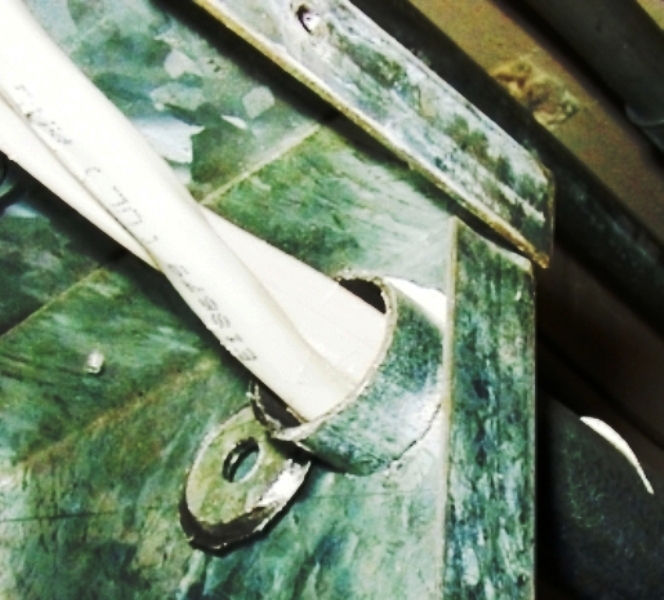 Excessive cable jacket within the "enclosure"
NO bonding of the conduit. The 'remains' of the hole, hanging in the enclosure. And there must be a lot more that is out of the range of your lens. BTW, what ssize is the 'enclosure?? 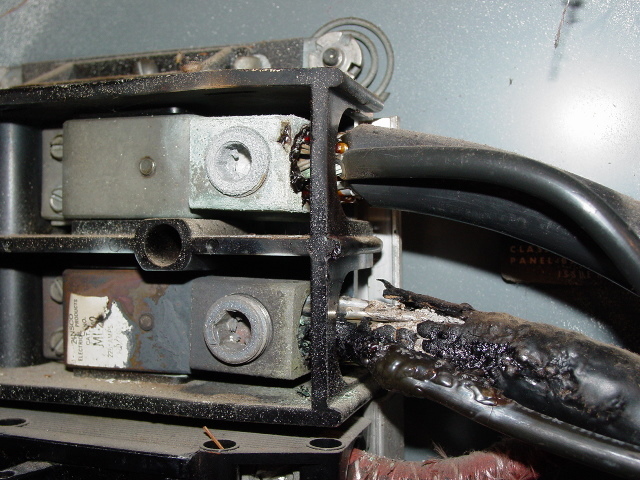 ..
What code violation is "excessive cable jacket" inside the enclosure? There is a possible pipe fill violation. Well there is definity some problems here. 1.Subpanel grounds and neutrals comebined. 2.Extra set of wires in the lugs with feeders going somewere without over current protection. 4.Freeder Neutral not reidentified as white. 5.Loose connection on lugs panel buned up needs replacement. 6.I hope they derated all them wires in that conduit. Insulation overstripped on a couple of wires? Can't see it too well but what's going on in the top left corner with the knock-out possibly left open and no grommit? What the heck is this panel? Federal nonsPacific??? I've only ever seen Square D, CH, ITE, GE, Siemens.... this is new to me....or old...as the case may be. That lovely panel is our old friend, Zinsco. Popular here in So Calif. along with FPE and Pushmatic. I'm guessing this is actually a main service panel with NO MAIN breaker. I looked again. It is a main service panel. The top 2 lugs are for the service entrance, while the 2p70 is the "lighting main" for the lower half of the panel. The top 2 pole breaker is "legal" but the 1/2 breakers in the center are not.